My corsages are made to celebrate holidays and special occasions and can be worn or displayed. Many of my customers are corsage collectors, and display their corsages as holiday decorations in their home, special ornaments to display on their Christmas tree, keepsakes for baby showers and weddings, and decorations on special gift boxes. These are just some of the ways you can enjoy my creations, but of course, you can always wear them too! I use a variety of vintage materials such as party favors, spun cotton and chenille trims, ribbons in every color, mercury glass bulbs and beads, and much more when crafting each corsage. In addition to corsages, I also create special occasion tussie mussie lapel pins and tiny posie pins. I pair them with vintage ladies hankies and / or tea cups in gift sets. 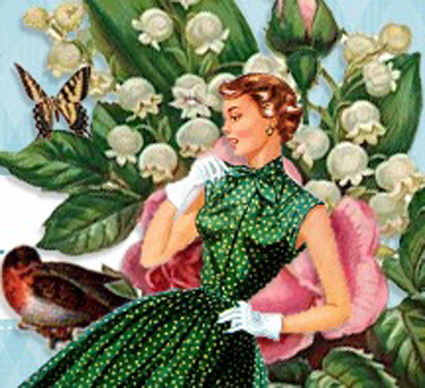 They make splendid and memorable gifts for lovers of all things feminine and vintage! I hope you’ll take the time to look through my gallery of creations. Every item is one of a kind and not mass-produced. These are hand-crafted keepsakes made to be treasured over time. I have collected these vintage trims over years, and now offer them as corsage assemblages for you to love. Sign up for my e-mail notifications about new items or upcoming sale events and check out my blog. Feel free to contact me with any special requests you might have for a custom corsage made just for you and your very special occasion. Thanks for stopping by! My corsages are sold exclusively in my Etsy store.